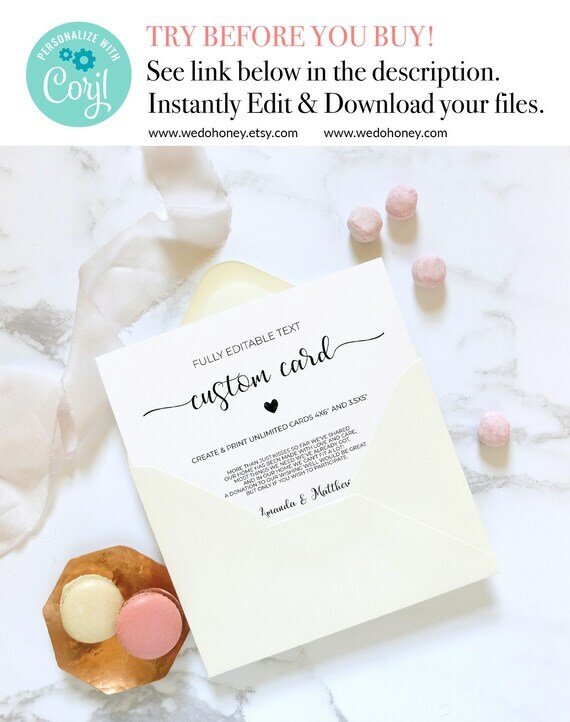 Create your fully editable card prior purchase. All text is editable, you can choose between 2 sizes 4x6" or 3.5x5". You can create wishing well cards, bridesmaid proposal cards, thank you cards and any other cards you wish. If you prefer another background color you will receive a full collection of colored backgrounds that you can upload on your template as background. Trending modern calligraphy text is editable and you can customize calligraphy glyphs directly from the template in the font options. Edit your custom card with Corjl.com right after purchasing directly from your browser. ••• No software download needed!! ••• Save as PDF with bleed and trim marks (or without). - Custom landscape card 4x6"
- Custom landscape card 3.5x5"
In your Etsy downloads, you will receive a color chart zip files full of backgrounds high resolution with 50 wedding colors (see listing pictures for details about colors). 1. After purchasing the listing, you will receive an email shortly (usually immediately to your etsy email, be sure your email it’s updated) from 'Corjl' with a link to access and edit your file. 3. Download your files in JPEG or PDF and print, email or post! **To personalise calligraphy glyphs (for calligraphy fonts), we suggest to use as browser Chrome or Firefox. Sometimes if you use Safari not all calligraphy glyphs will be visible. ** On mobile devices or other handheld device you can only replace current text, you CAN'T make customizatios from mobile (colors changes, add pictures, add backside, customize glyphs or additional editing options from mobile). - Print at home or take files to a print shop. For PDF files you can use the option "print multiples per page" to format multiple cards on 8.5"x11" or A4, you can get trim marks and also show bleed. Can also be printed on white card stock from home or a print shop, like Staples, Office Depot or FedexOffice. If you want to email or post your invitations, save the file as a JPG or PNG. There are no refunds or exchanges on printable items. Please ask us any questions before purchasing. THANK YOU FOR CHOOSING OUR SHOP! If you have questions or need support please contact me to conversations or email. Gold Favor Tag Template, Fully Editable Text, Calligraphy, Custom, Size: 2X3.25" and 2.75X4"